Hungary returned to the European championships after 44 years with an emphatic victory over Austria, as goals from Ádám Szalai and Zoltán Stieber guided them past old rivals Austria in Bordeaux. Ádám Szalai broke the deadlock to sink Austria early in the second half, despite the opponents enjoying most of the chances in the first period. Minutes later, Aleksandar Dragovic received his marching orders after a second booking for a foul on Tamas Kadar. With Austria stretched in an effort to equalise, they were punished on the break which was concluded with a sensational Stieber chip late on. Following an unorthodox kickoff from Austria, their star man David Alaba sent Hungarian hearts racing as he rattled the post with a long range strike after less than a minute. He latched on to a dispossession and let fly, with his shot bouncing low and coming off the frame of goal. Continuing to pose a threat as the most versatile player on the pitch, Alaba got another taste at goal a couple of minutes later, after Arnautovic found his run with a sumptuous pass through the box and defensive line. However, it was a simple stop in the end for goalkeeper Kiraly who clutched on to the ball gratefully. After a bulk of a somewhat insipid first half passed, the Hungarian keeper was again forced to make a stop, thwarting Junuzovic's stab after a long ball was knocked down to him for a half-volley just outside the box. Harnik then was rightfully distraught as Austria looked to finish the first half strong. A break left plenty of space to run for Arnautovic who surged into the box on the left, zipping a pass straight across goal and, with no defenders and just a gaping angle to strike the ball at, he slipped and knocked it out of play. Hungary's chances, meanwhile, were few and far between. Late on in the half, Dzsudzsak broke free into the box and tried to sneak it past Almer at the far post but it was dragged wide. Feeding off the momentum fuelled by the late chances, Hungary proved a strong match for Austria to start the second half.. After a cross was zipped across goal, they attacked at the other end with a Gera shot going wide, before Dzsudzsak forcing Almer to tip the ball away with a long range bullet. Austria were dealt a tough blow with the departure of Junuzovic in the moments after. An injury sidelined him for Sabitzer as Hungary were under the illusion that the goal was there's for the taking. It turned out that it was more than just an "illusion". Just seconds before, he was presented with the ball in the box after a defensive mistake but was closed down. On the second chance, Ádám Szalai would come good. Working down Kleinheisler's ball before a give-and-go, he made his way on the end of the through ball and prodded it past the onrushing goalie to put Hungary one up. To make matters worse for the Austrians, they lost Aleksandar Dragovic in the minutes after the goal to a second booking. The referee believed he was worthy of another yellow for a foul on Tamas Kadar. 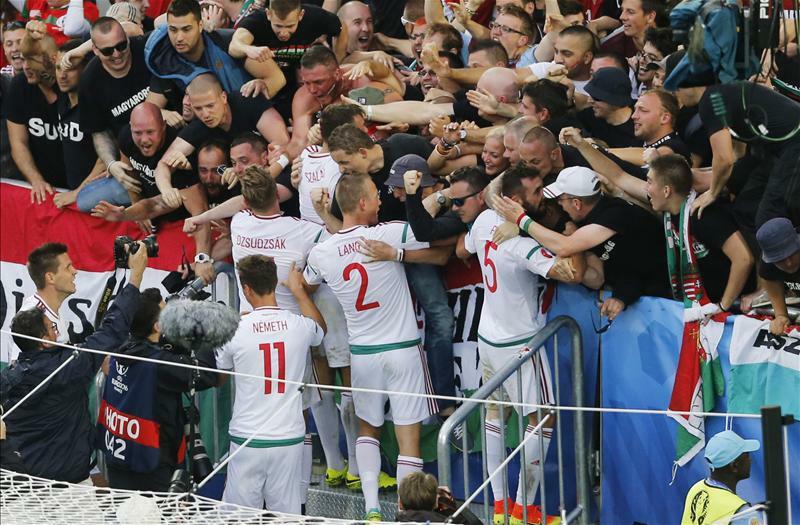 Hungary continued to work and grind out the win while Austria soon became desperate. A plethora of tackles flying around the pitch made for a frantic setting late on. And when Austria overcommitted in a last ditch attempt to save the game, they were punished in style. Priskin broke forward and played it into the other half with Zoltán Stieber at the other end, as cool as you like, he chipped the keeper and sparked jubilation for a nation. The team and players huddled in what will go down as an iconic day in Hungarian football history.